Qualcomm has built a strong position in developing and manufacturing mobile processors based on the ARM architecture, with its Snapdragon systems-on-chip (SoCs) serving as the heart of a number of leading mobile devices. If you are using a Google Pixel or a Microsoft Lumia smartphone, among many others, then you are using a Qualcomm Snapdragon of one generation or another. While the next Snapdragon generation is just about confirmed as the Snapdragon 835, the specifics about the new SoC haven’t been revealed. On Tuesday, some questionable information leaked from a Chinese website that allegedly provides some new information on Qualcomm’s latest SoC, as Neowin reports. We already know from Qualcomm that the Snapdragon 835, model number MSM8998, will use Samsung’s 10nm FinFET fabrication process that should provide unparalleled efficiency by packing more parts into a smaller space. Qualcomm indicates the new SoC should use 40 percent less power than the Snapdragon 820 and 821 that preceded it while providing 27 percent better performance. The Snapdragon 835 will also offer faster Quick Charge 3.0 technology. Otherwise, Qualcomm didn’t provide any additional details on the Snapdragon 835’s design. The leaked information, however, if true, fleshes out the specifications for us. 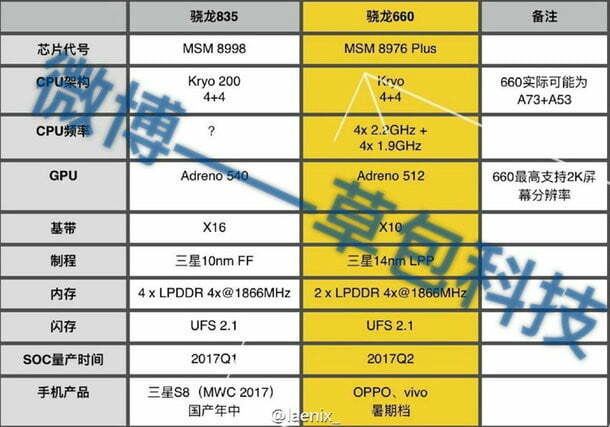 If it holds up, then we should expect the Snapdragon 835 to utilize an octa-core Kryo 200 CPU, X16 modem with 1Gbps download speed supporting LTE Cat 13, and a disappointing Adreno 540 GPU. That last part would be a recycling of fifth-generation GPU technology rather than moving on the sixth-generation offering such as the Adreno 630. Some of the other specifications included in the leak create some questions about the information’s accuracy, according to Neowin. For example, the lower-end Snapdragon 660 listed in the leak indicates a higher-performance CPU component than the flagship Snapdragon 835. In addition, the model numbers don’t match up well with the components themselves. In any event, we should not have to wait too long for more reliable specifications. Samsung’s Galaxy S8 could use the new Snapdragon 835 SoC and be released at Mobile World Congress 2017 and so all should be revealed then, if not sooner. In the meantime, remember these are all rumors and at the very least, the Snapdragon 835 should represent another step forward in mobile battery life and processing power.